Maybe it’s the desire for a simpler time—when gas was cheap, land was undeveloped, and the pace of life was slow and savored. There’s certainly a romantic version of the American road trip that feels antique, like a glass bottle of Coca-Cola or the crooning sounds of Johnny Cash. When we hit the road, we are tapping into another era. We roll along in a time machine, back to when we read books on the page instead of the screen, scrolled through photo albums instead of phones, and enjoyed sitting around the campfire instead of the TV. 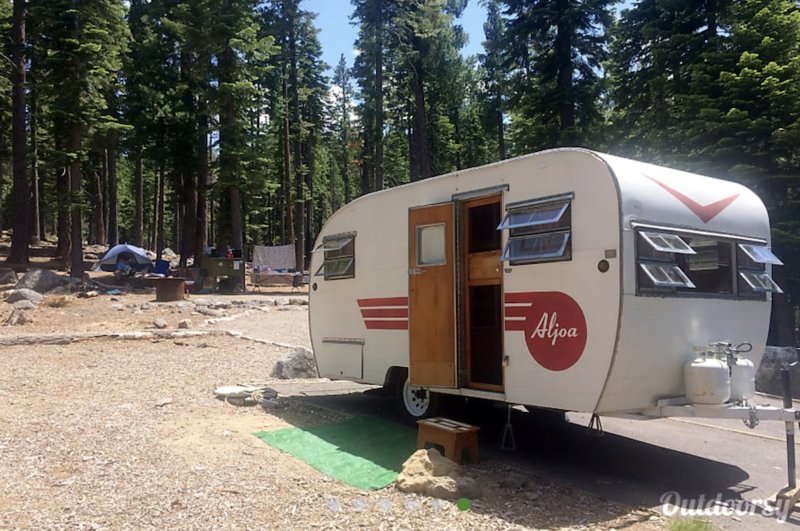 If you’re looking to travel back in time and enjoy a weekend away from modern life, check out some of Outdoorsy’s most vintage rigs. These old trailers have been brought back to life and restored to enjoy many more decades exploring America’s open roads. 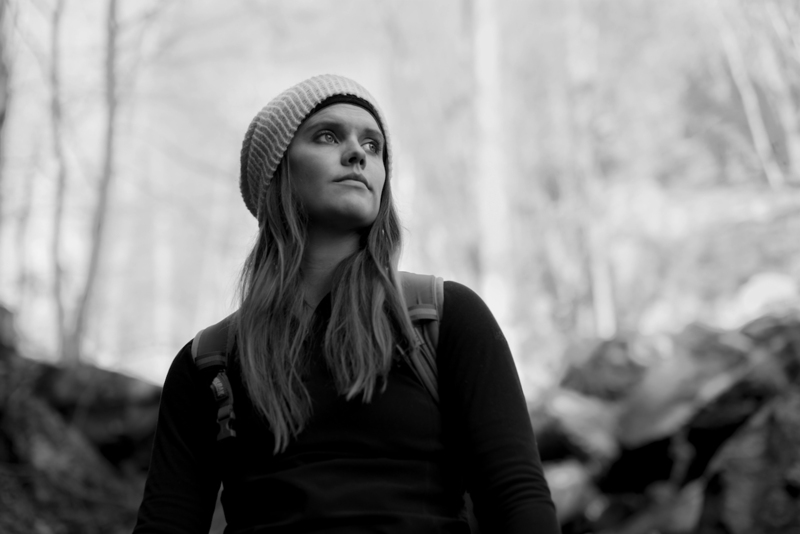 Hitch up and pack your free spirit. The adventure of yesteryear is just a booked trip away. 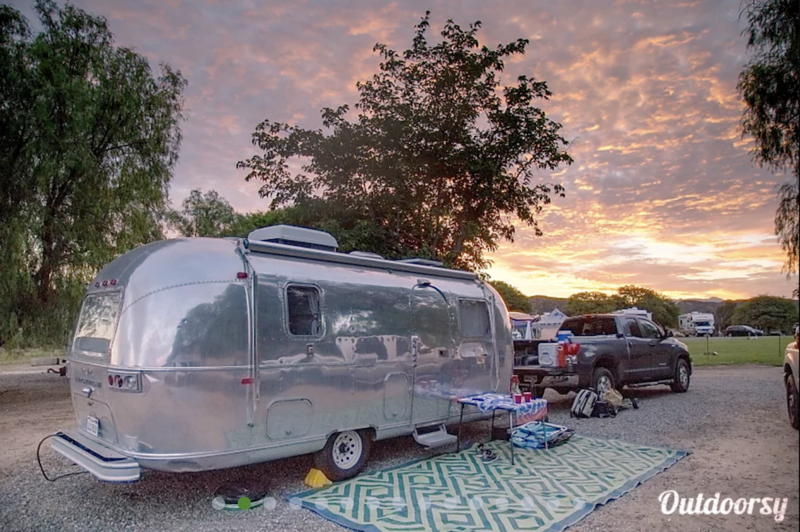 Airstream travel trailers are one of the most iconic symbols of Americana. Their bullet-like shape and aluminum shell have been rolling the roads of the USA since the 1930s. These rigs were built from surplus supplies left over from World War II and they are one of the oldest brands of trailer still on the road today. Rent this renovated 73-foot trailer and “Live Riveted,” as their slogan encourages. Airstream living is an enviable one. The Argosy, a close cousin to the Airstream, is similar in style and history. The Argosy was Airstream’s more affordable line of campers and manufactured throughout the 70s. Renovators all over the country have found equal fascination in the bodies of Airstreams and Argosies, seen here in Olivia—a 24-foot rig located in Bend, Oregon. What better way to explore the Oregon high desert than in modern luxury with an antique twist? Explore greater Los Angeles driving around in this vintage rig. The interior has been renovated in clean white, with wood accents and rust-colored fabrics. Put on that ruffled apron and cook over the sky-blue stove. This light and maneuverable trailer features an outdoor shower, perfect for rinsing off after a salty day at the beach. 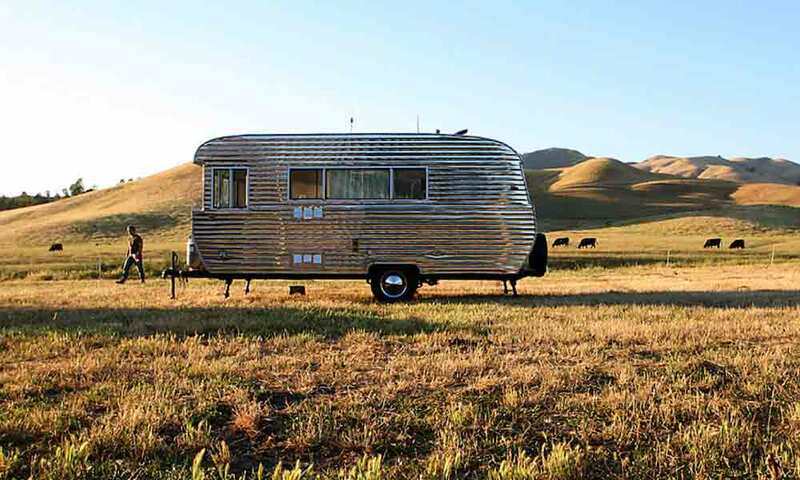 Featured on the design website Dwell, this trailer is truly one-of-a-kind. The most notable features include a fold down balcony that seamlessly integrates the surroundings into your living space. This reimagined antique trailer also features modern technologies like solar power so that off-grid camping is a breeze. In just 112-feet, you’ve got a walk-in shower, a workspace, and sleeping for 3. 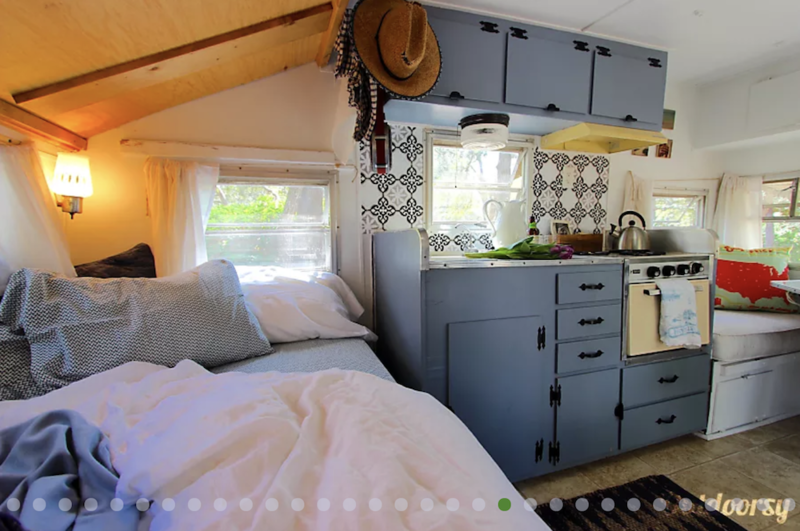 Treat yourself next time you’re in Novato, California to a custom camping trip in this rig. 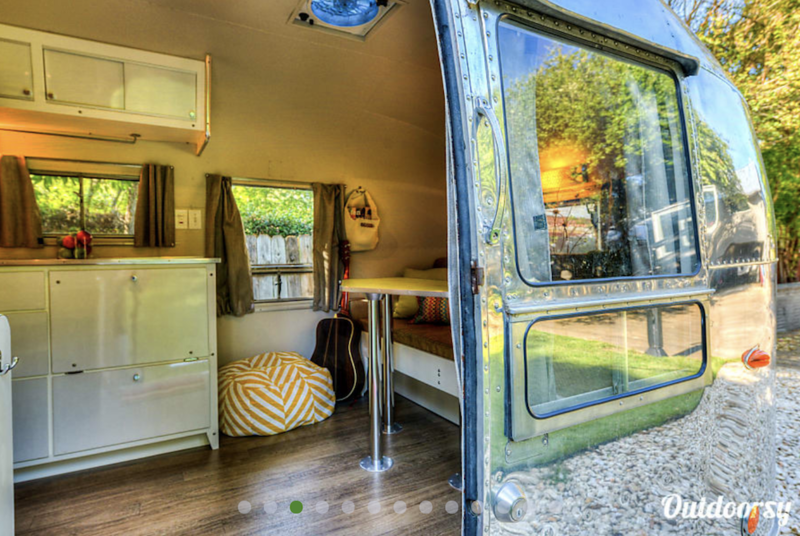 This 13-foot Canadian rig is 70s retro on the outside and Scandinavian luxury on the inside. 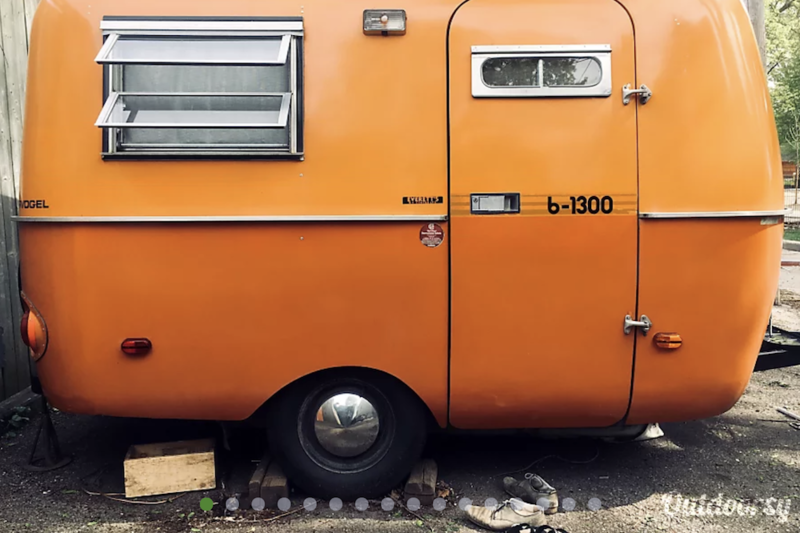 Affectionally referred to as “the pumpkin coach,” this Boler is light and easy to tow at just 1,600 pounds. An ideal rental for coffee lovers, this tiny home comes equipped with a vintage coffee grinder and Bialetti espresso maker. With room to sleep four, this is a great rig for a small family or couple. Explore the Florida panhandle in this 1966 Mobile Scout Travel Trailer, deemed “The Beach Chigger.” You’ll be kept safe from sand flees at night in the cool blue interior of this vintage rig. Play board games while watching the gulf waves lap outside your window. 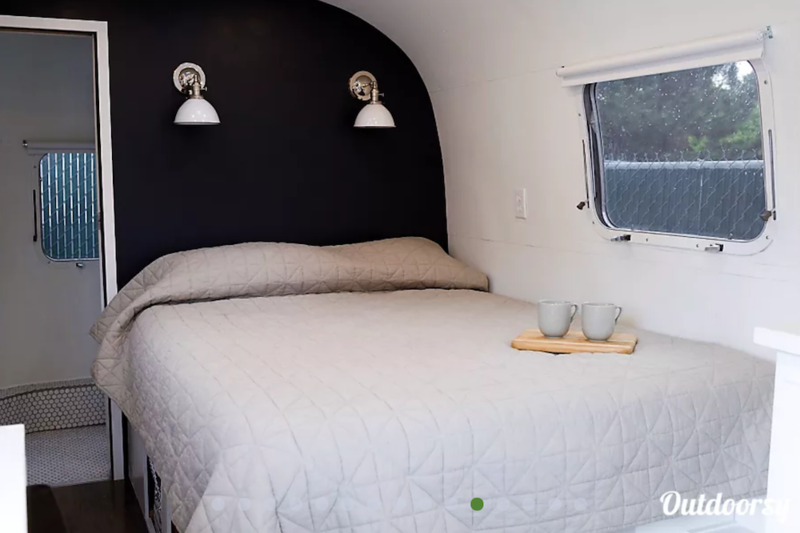 This Austin-based trailer has been renovated and reborn as a beautiful rolling home that sleeps up to 6. Campers will be envious at the mirror-like exterior and inviting dinette area, perfect for board games or storytelling. Airstreams are known for being easy to tow and aerodynamic. This cruiser is an excellent rig to travel comfortably with a family in 60-year old style. 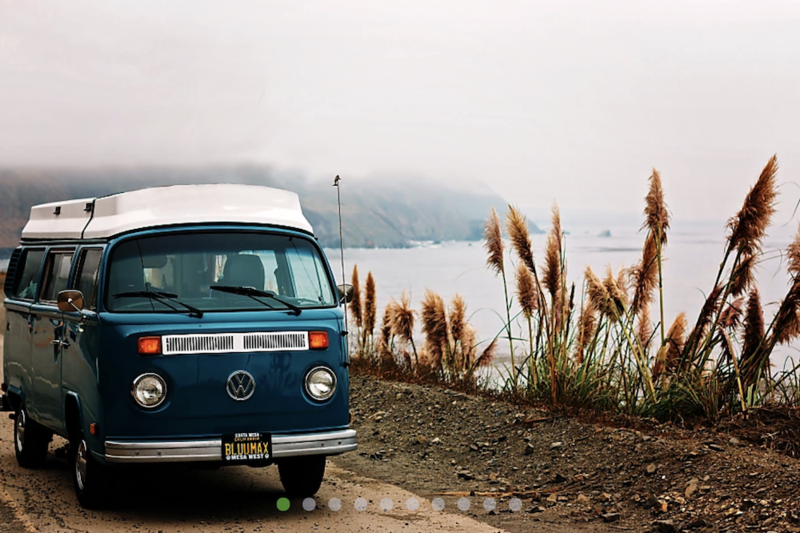 There’s perhaps nothing more iconic on the road than the shape and look of a VW van. These boxy vans beg for surfboards strapped to the top and a “free love” sticker on the back. 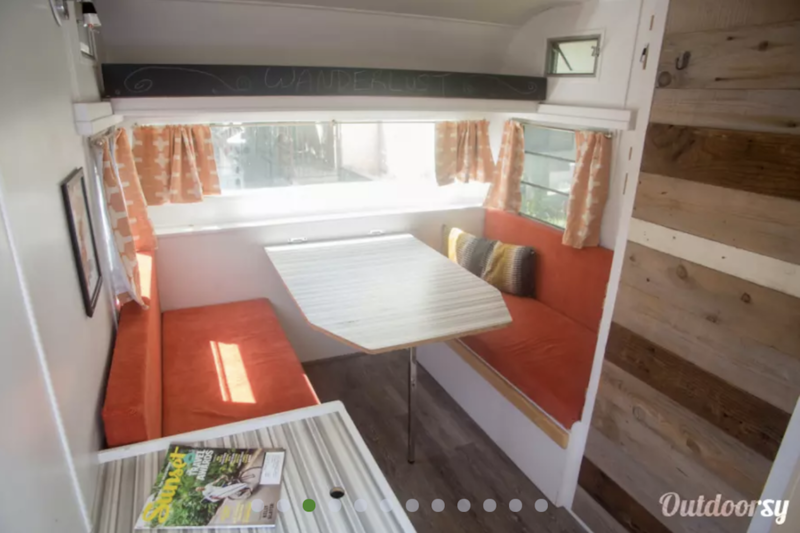 The team at Vintage Surfari Wagons in Costa Mesa, California have a fleet of refurbished Westfalias that will have you living the hippy life in no time. This ’78 van is a rich Pacific blue color on the outside and comes equipped on the inside with everything you need for a groovy road trip. 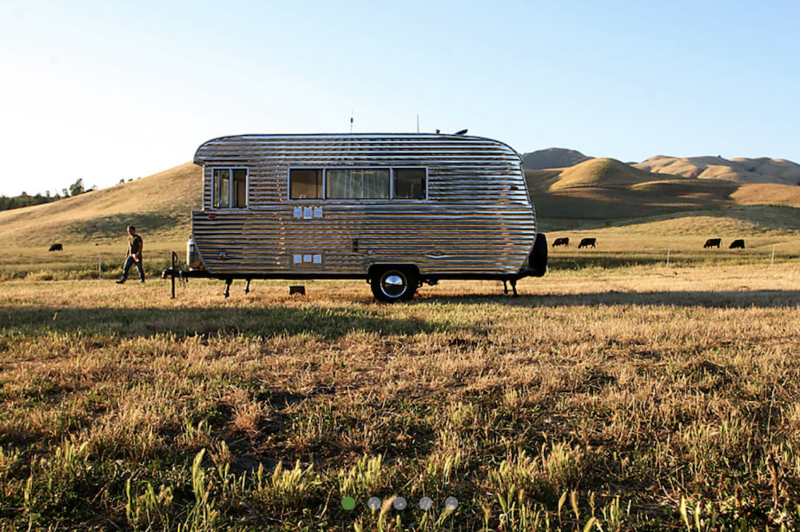 This 63-year-old trailer is a rolling time machine. The wooden cabinetry and mustard-colored decor are pulled straight from the 50s. Preserved and restored into an immaculate vintage rig, this trailer is waiting for an adventure into the redwood forests of California.